Saturday Racing Tips - Itipsports. Get the best horse racing tips now. This Saturday 16 February Melbourne Racing tips sees the Lightning Stakes, a Group 1 weight-for-age race at Flemington during the Melbourne Autumn Racing Carnival and is run over 1000 metres with prize money of $750,000. Our Saturday Racing tips will focus on The Lightning at Flemington which will also see Group racing for the 3 year olds with CS Hayes Stakes for the 3 year old colts and geldings and The Vanity for the fillies and of course in Sydney Racing tips the mighty mare Winx is back for her first run of her final campaign in the 1400m Apollo Stakes where she has been installed a $1.12 favourite. The Lightning was renamed the ‘Black Caviar” Lightning Stakes in 2013 in honour of champion mare Black Caviar, who became the first galloper to win the Lightning Stakes race three years in a row years 2011,12 and 13. In 2016 the race was won by the brilliant Chautauqua and these sprint machines are two of the very best amongst a long line of legend sprinters to win this race. Australia’s best sprinters have won this race over the years which is run down the Flemington ‘1000m’ straight course with no turns involved that suits horses with a love for the Flemington straight. 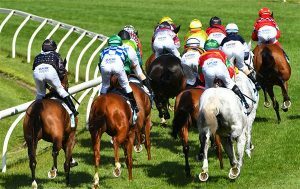 Melbourne Racing tips heads to the Newmarket Handicap in three weeks after the Lightning and it is an obvious race to be set for after the Lightning. From there successful horses will to head north for our Sydney Racing tips races such as The Galaxy and TJ Smith Stakes during the Sydney Autumn Racing Carnival. Speaking of Sydney Racing tips Winx will appear in the Apollo at Randwick racecourse where she is likely to come up against 7-10 horses as opposition of which many will also be trained by here trainer Chris Waller. From there she will go onto the Chipping Norton over 1600m, George Ryder over 1500m and then finally the Queen Elizabeth Stakes during “The Championships” over 2000m at Randwick.